I just wanted to say thank you for creating the most magical wedding for us - It was beyond our expectations and fulfilled all of our dreams! You are such a pleasure to work with; both a calming force and the embodiment of fun, and we could not have imagined our wedding without you in it. Your professionalism and ease were truly highlighted throughout the day - you managed to deliver everything we asked for whilst including pockets of surprise and girly giggles (my birthday cupcake and balloon were exceptional!). It is the added moments that you created (such as our shots around the table) that make you amazing. 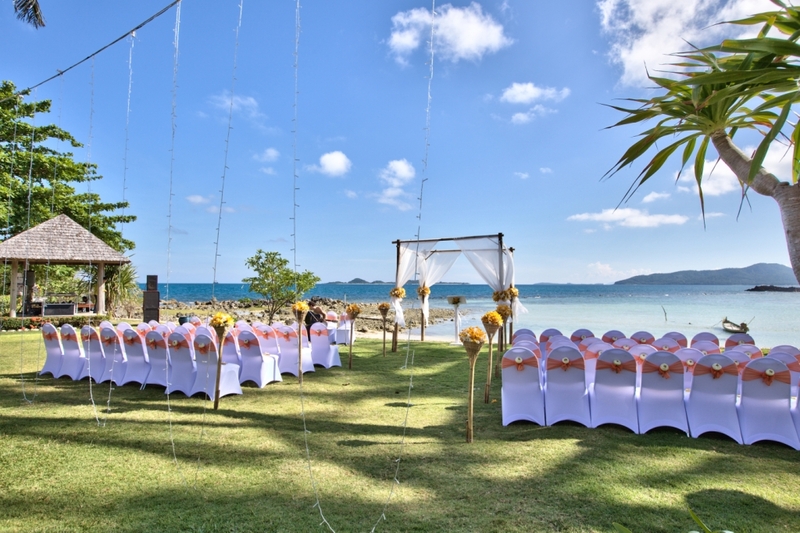 I could not recommend you enough to anyone wanting a luxurious yet relaxed wedding in tropical paradise!! You enabled me (a complete control freak) to relax and trust in your brilliance and that in itself is miraculous. Our flowers, cake, food, cocktails (i could go on for days...) were of the most incredible quality and the team around you - celebrant, make up artist, musician etc - were all of the highest calibre. 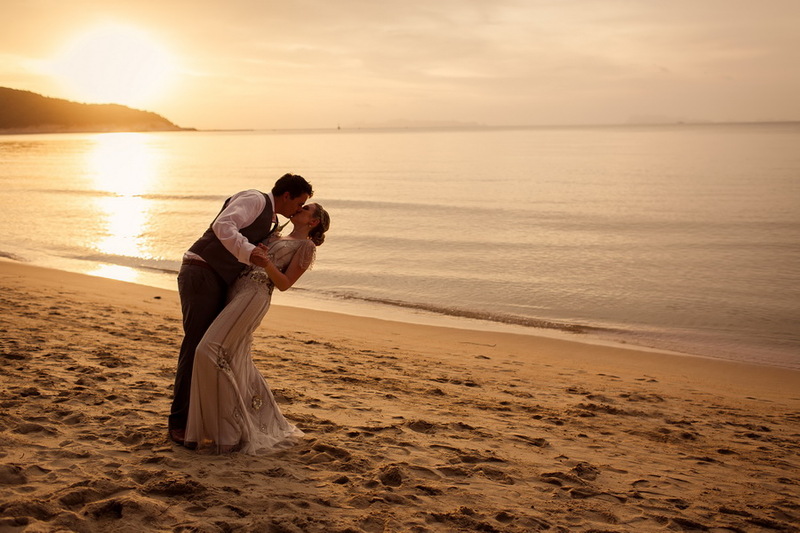 In short, you are a dream - I hope that every couple looking at getting married in Samui is lucky enough to have you by their side! You are now a part of our story and one we will never forget. We look forward to catching up with you in Samui soon! How are YOU? I hope you are doing really well Juliette. You are so Amazing...the memories left with us will be treasured forever. Your Team, Petra, the Team at Ban Suriya & all the contacts that made our entire time possible - Surpassed every single expectation we ever had! I'm Sorry if I have not communicated until now. We are still on our Honeymoon! I have not sent an email for at least 2 months! its been wonderful! Currently we are in Singapore, and we leave to go home in a few days! I have missed having chats with you actually.. Not the decision making parts but just chatting! We have travelled around Thailand, Vietnam, Malaysia and Singapore and WE have put on many kilos!! eating amazing dishes as we have travelled around! All of our guests had such an amazing & unique experience, and it was an honour to plan our days with you and I am truly grateful and appreciative of all your hard work and efforts. I apologise for my indecisiveness and if I were too demanding. When we come to Thailand next I will get in touch with you and hopefully we can catch up. Please take care, All the very best to you Juliette and your family. Thankyou for everything, I will never forget it. 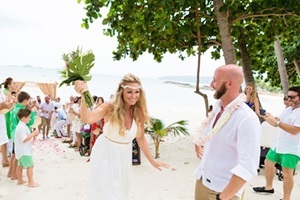 Juliette is a wedding planner extraordinaire; helping to successfully execute a wedding despite all parties being in different countries and all correspondences done via email and Skype. We hired Juliette to help coordinate our wedding from start to finish (including the actual day) and were completely blown away by how everything came together. Juliette always had everything in control and there was never a time where we needed to worry about anything. We couldnâ€™t have asked for a smoother execution of the wedding day itself. Juliette and Maynie did a wonderful job shepherding everyone, including the bride and groom. All our guests had an amazing time, the staff were great and everything was smooth. We feel, and all our guests concur, that Juliette is the reason our wedding was absolutely unforgettable for all the right reasons. 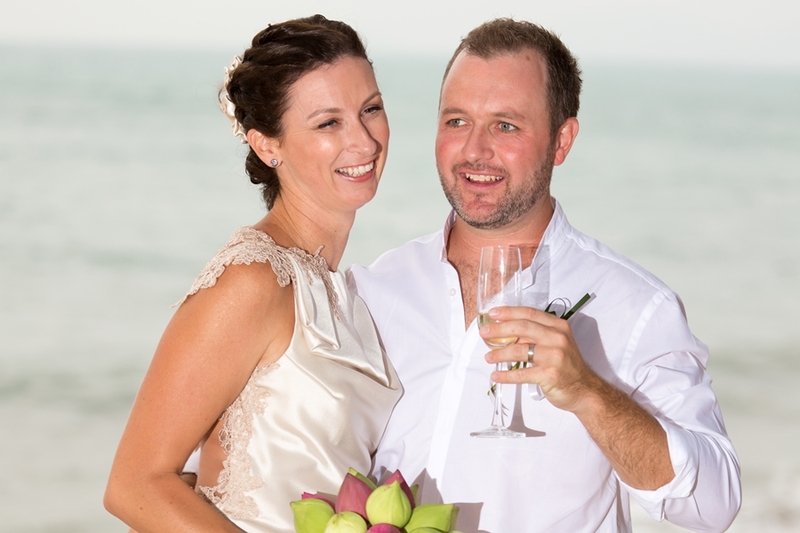 We were lucky enough to host our wedding (week) at Baan Kilee in September 2014 & it exceeded our expectations at every turn and in every way. 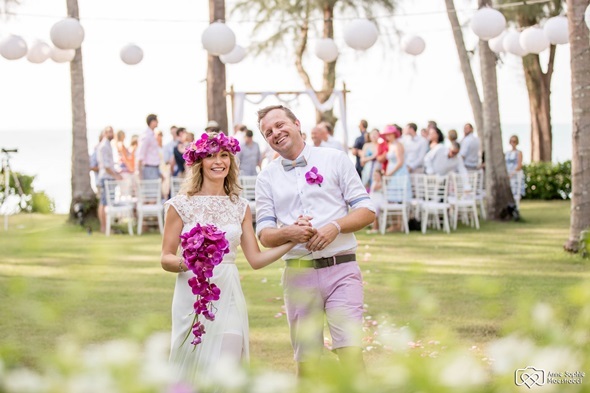 I cant recommend Baan Kilee highly enough â€“ this team are absolute experts, they know how to produce a top class wedding/event and worked with us to keep our dream wedding, within budget. 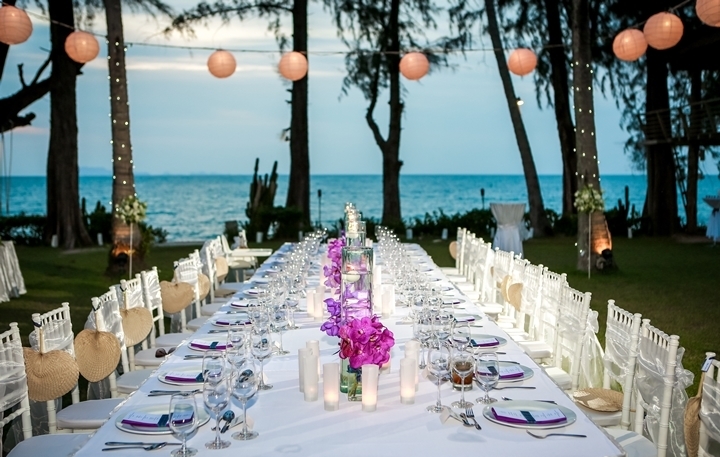 We took over Kilee, Puri and A Chorn (the neighbouring villaâ€™s) and welcomed our nearest and dearest to Koh Samui with three events all produced expertly by the team. An opening dinner (35 people) on the Wednesday night (buffet style thai food â€“ the best Iâ€™ve eaten) and a fire dancer who, having seen a lot of these guys and not impressed by many, I thoroughly recommend. (Meet and greet for all guests (82) at Nikki Beach on the Friday night). Diving into the pool in a silk wedding dress, ha! Still mixed feelings.. Finally, the pool/after party spread across Kilee and A Chorn on the Sunday (70 guests), masseuse, volleyball and a hog roast â€“ perfection! Every request was met with a smile, delivered with expertise and in many cases bettered, within budget and without seeking thanks. The estate was kept pristine throughout the week without us ever seeing or feeling the work going on behind the scenes. A magical experience, I can't thank the-Tina's, Rose, Poos, Oi and the team enough for making our wedding day, and the week around it, perfectly magical! Now that the dust has settled after the wedding we just wanted to write and thank-you and your team for an amazing few days. 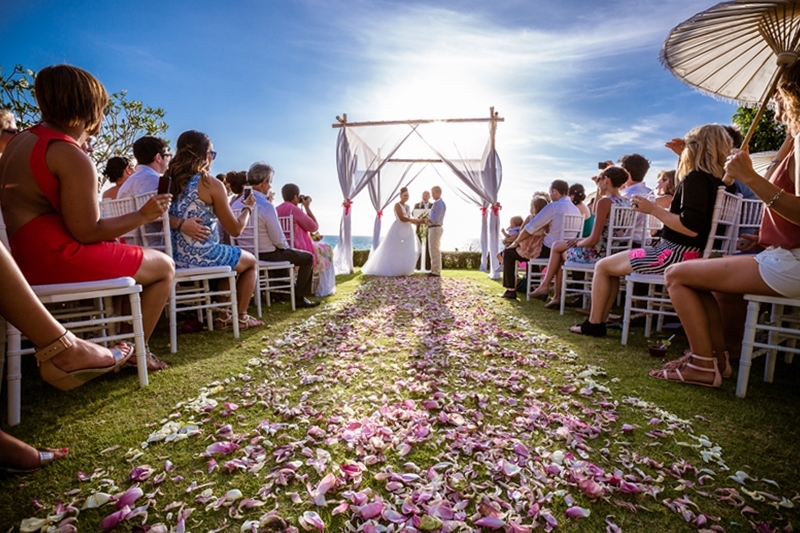 Tina and Signature weddings has been professional and provided excellent service from first contact, through the planning stage, right up until the end of the event. We are so grateful that you have helped to make our wedding day so special and unique for us. Every little question has been answered promptly and with sensible options helping us to plan the day without too much headache. The venue could not have been more beautiful, it was perfect, the tables, wedding setup on the beach, flowers etc were absolutely beautiful, well pre rain anyway ! The staff coped well with the rainstorm and had everything back on track after it with huge calmness and efficiency. The preparation team were unobtrusive and polite and did a beautiful job making the place look special. The food and cake was great especially at the BBQ the next day. Dany and Anne-Sophie were friendly and professional and did their best to make us scrub up well for the photos, thank-you to them for listening to our wishes and doing their best to make us look beautiful! We are very much looking forward to the professional photos coming through. Please pass on our thanks to all involved for a truly memorable and special occasion we could not have asked for anything more. We would also like to mention Baan Kilee and the team there. The place was beautiful the perfect location for our wedding, but it is the staff there who really make it a wonderful venue. In particular Khun Pooh and Rose, who anticipated our every need, from serving us champagne in the pool, to playing with the children and recycling the wedding flowers. They organised us beautifully always polite but with a smile and a joke to lighten things up. They really make the place an amazing wedding venue and holiday villa. The chef is also fantastic, I lived in Thailand for 4 years but didn't want to leave the villa as we had some of the best Thai food I have ever tasted there. We have already thanked the staff there but thought it would be nice to pass on our thoughts to the owners. Overall, this has been the most beautiful and special few days for us, so a huge thank-you to everyone that has contributed. We will recommend signature weddings and villas without hesitation to all our friends as we had such a positive experience with you. Me and Katrine want to thank you so much for making our BIG day so perfect. 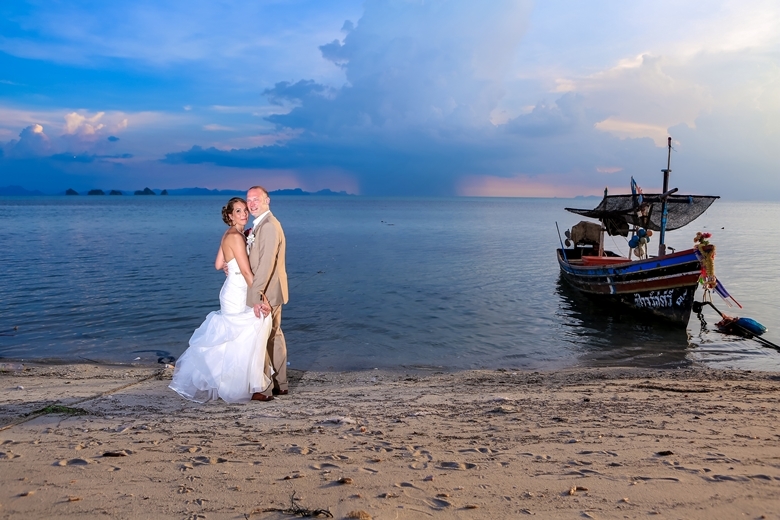 To Tina and the crew of Signature wedding Koh Samui. Words cannot express the gratitude I have for all you have done for Craig and myself. You made our wedding celebrations magical to say the least. From our first meeting, too our countless emails you have been so wonderful. Our 3 day wedding event was that of which dreams are made of. 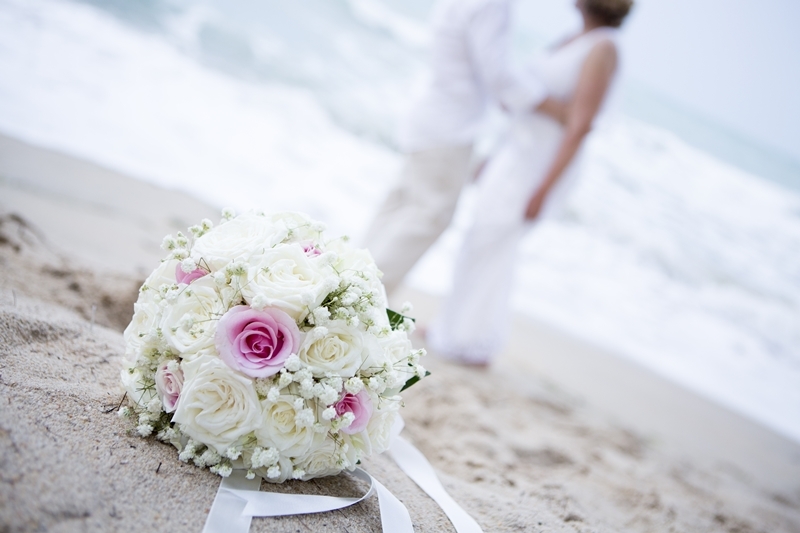 If you are looking at holding your own destination wedding look no further. The team from Signature weddings are second to none. 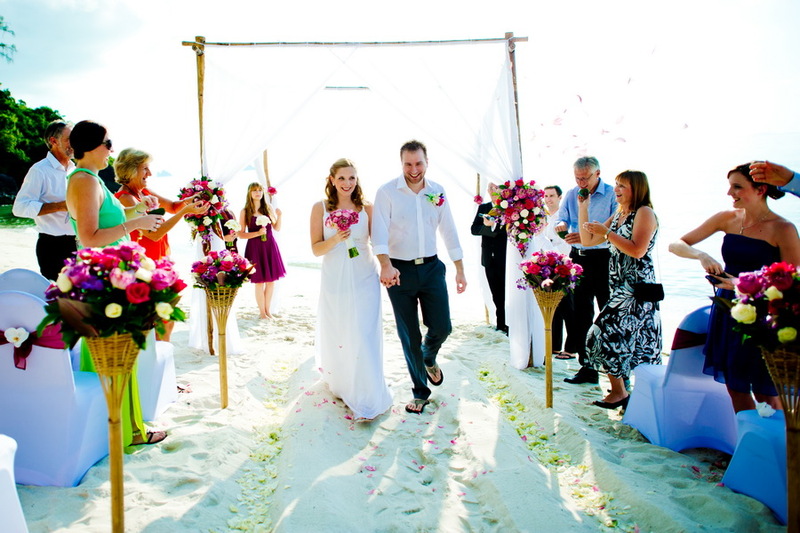 They made every part of our wedding preparations simple and stress free. And trust me they delivered on every single level. Every single part of the wedding was detailed and spectacular. They will make those little touches that make it even more special. I myself am a performing arts teacher and so details are my life and I couldn't have been happier. Not one part was lacking, not one part was sub par. 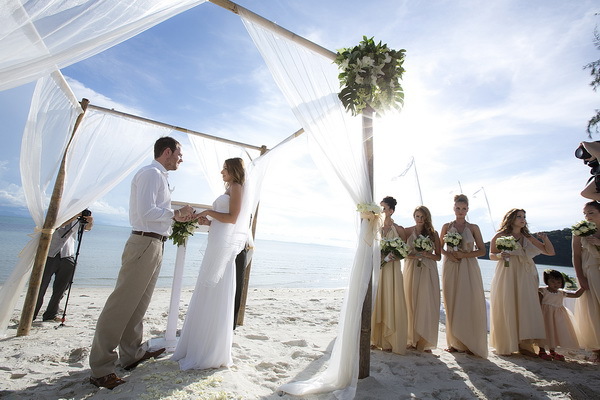 The entire team worked tirelessly to make our wedding perfect. Thanks for everything. Mb and I will spend sometime in the near future filling out reviews and making sure people are aware of wonderful experience using your team. Thank You so much for making the day run smoothly. It was all that we had imagined and more. And I canâ€™t believe that it didnâ€™t rain at all! Everyone that we dealt with (the A team)- were all a delight to work with (Johnny, Anne Sophie, Steve & Dany). Each and every one of them added something special to our day. Thank you for all of your help over the past year, it was such a special day and it wouldnâ€™t have been possible without you. Thanks for an amazing day, it was all perfect, we has a great time. We couldn't have had a more perfect day, it was absolutely amazing! Thank you so much for all of your hard work, we really couldn't have wished for anything more! We would love for you to use our photos for your website. Also, are there any websites where we can write recommendations for you, as we would like to share this amazing experience with anybody potentially looking at using your team in the future? We Just wanted to say a huge thank you to both of you. Our wedding day was more than I could have hoped for and you both made it truly special. We had such a relaxing and great day with all our friends and family, and we are very thankful for all the hard work, gorgeous decorations and beautiful food. We truly couldn't fault a thing! It was amazing. I just wanted to say a huge thank you for organising the wedding. The set up was everything I imagined it would be, just gorgeous! The lanterns, tea lights and all the flowers were just beautiful! It was definitely a wedding no one will forget. It was stunning! Please pass on our compliments to the chefs. Food was delicious. Everyone enjoyed their meals and the left overs the next day too. We have inspired people to get married overseas now too. Great for us as that means more holidays. Ha ha. We had the best day of our lives, thank you so much for a truly spectacular day. Every aspect of it was wonderful. The day was everything we could have dreamed of and thank you again for all your help. OH MY GOD! WOW!! What a superb day!! Absolutely EVERYTHING went off without a hitch and everything was PERFECT - there was NOTHING that we would have changed! Thank you SO much for doing such an impeccable job Tina - honestly - everyone was blown away over how incredible the night was and it was all thanks to you. Everyone said it was the best wedding that they have ever been to and the bar is now too high for everyone else. The food, set up, drinks, music, Johnny, Carla, fireworks, lanterns, etc were spectacular!!! And most of all, Simon and I had a perfect night. A fun night! Compliments to all entertainment booked - out guests really enjoyed everything! We cannot say enough about the services provided by Tina and her team. 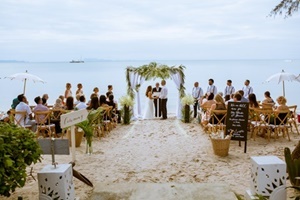 Living so far from Koh Samui its hard to plan a wedding trusting someone you have never met but with just a few emails back and forth Tina arranged everything exactly as we had envisioned!! Tina made the process stress-free and easy - always answering emails promptly even when she was on maternity leave. 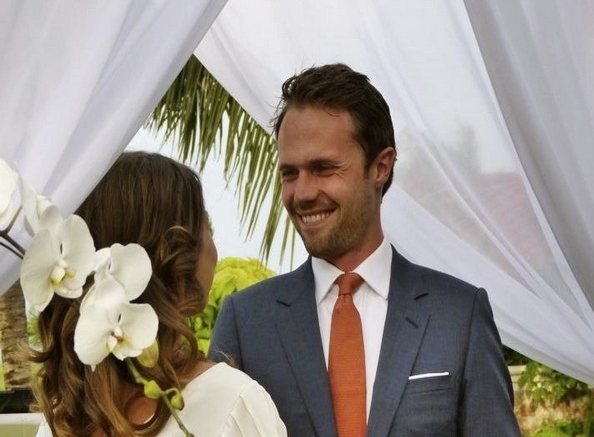 We are very happy we chose villa Baan Asan, the villa itself is luxury, the ceremony set up and location was like a fairytale. Johnny gave the most beautiful ceremony. We chose Dan Gibbons to play during the ceremony and a few sets afterwards, he is a great talent and very professional to work with. DJ Steve Bray took over from Dan and led us into the party - again he is very professional and played everything we wanted and knew how to get the party started. We highly recommend Anne Sophie as a photographer, she had a great talent for capturing those special moments! We are really grateful for everything you did for the wedding - despite the weather it was still a great day and everything that your team did was amazing! The staff were really great and everyone really enjoyed the drinks food and entertainment. The sunset was truly amazing like someone had painted red across the sky! The wedding setup was really amazing - and just what we were looking for. Your professionalism at all times was really great! Our friends have all said it was just such a great time! I just wanted to take some time and say thank you again for all your hard work and dedication to our wedding. Everything was perfect, and I couldnâ€™t have imagined a better day. Everything went smoothly. All our communications were easy, thank you for being so responsive, even though you were on maternity leave and I am so happy we chose Ban Suriya as our venue and you as our planner for such an important day in our lives. You were very professional, honest, flexible when I asked for your opinion and ideas. It was a lot of time and hard work on both of our sides, and the guests were utterly amazed and impressed with every little detail and aspect of the wedding. They are still talking about it (especially my family) and have said it was THE wedding and social event of the year, indescribable with words and just like a celebrityâ€™s wedding. Everything from the venue being perfect, the setup, to the flowers, the decorations, to the entertainment - the baby elephant (wish we could have had him longer and taken more pictures with him and the wedding party and family), and Thai drum processional were huge hits. Not to mention Dan the guitarist (whom everyone loved) and Steve the DJ. The fireworks were incredible and the lanterns, also perfect, the weather was just right to release the lanterns. And of course Anne-Sophie and Dany were also wonderful to work with and did really well. Thank you for making it a stress-free day for me, I truly enjoyed myself and loved having my closest family and friends all in one place celebrating with me. Thank you Tina and everyone at Signature Weddings for creating the most spectacular wedding for us! 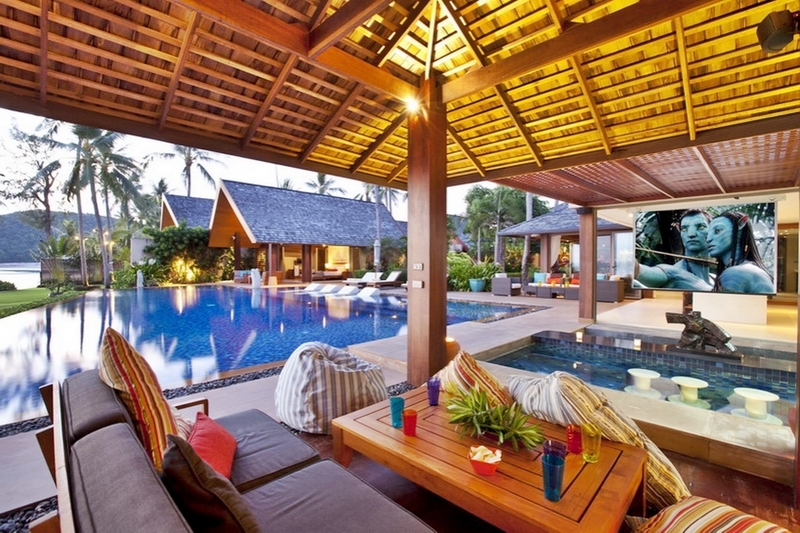 We are thrilled with every element and our stay at the amazing Baan Asan. It was 100% perfection! 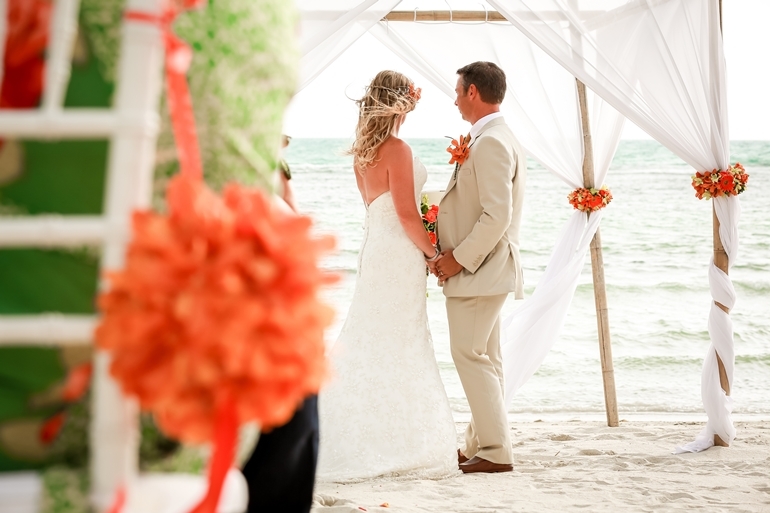 Every detail exceeded not just our expectations, but those of our family and guests. Signature Weddings has been an absolute pleasure to work with and we are very impressed by how easy and professional the whole experience was. This enabled us to really relax and enjoy our holiday and the big day. We really are so impressed by the high standards you provide from the food, to the flowers and the attentive service of all the staff. We wanted a modern, chic and glamorous wedding and that is certainly what we got. Thank you again for truly making our dreams come true! It was the best day EVER! The standout for us was really the perfect ceremony that Johnny delivered. It was truly unforgettable, so moving and emotional! Johnny brought such a lovely presence and personality to our ceremony which we dearly loved and will treasure forever. Lastly we were all blown away by how stunning the villa is, you were right about it having the â€˜WOWâ€™ factor. 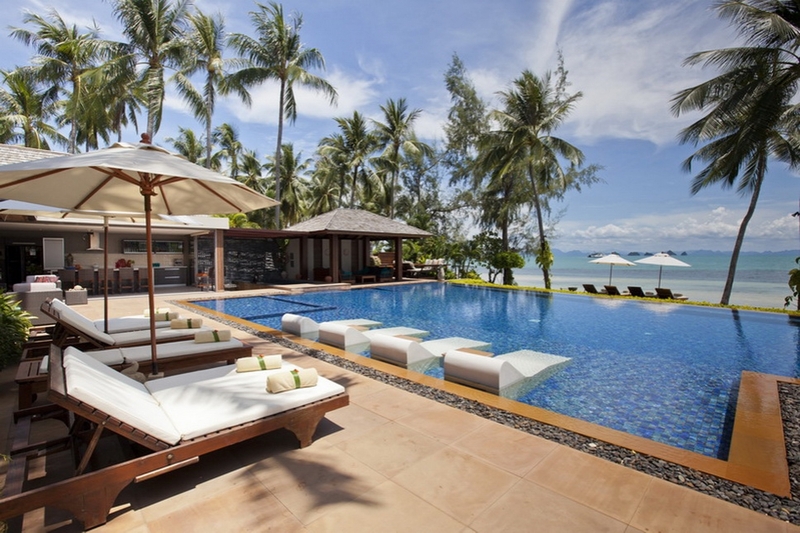 Baan Asan is pure luxury, again it totally exceeded our high expectations. This breathtaking venue provided the perfect backdrop to our wedding. We are all still talking about that sunset, words canâ€™t even describe! I strongly recommend this venue to everyone. We had most wonderful time and Pooh and the villa staff were just brilliant. We didn't want to leave! We will certainly be coming back again it made such an impression on us. Again Thank you kindly for your well wishes and for helping us create the best experience of our lives. We can't begin to thank you for all your hard work over the last year in helping us orgainse our amazing wedding, especially as you did all of that work whilst being pregnant and most of the critical work while nursing a new born - you are a legend!. All of our guests were blown away by the level of detail and attention given to everything and all had a fantastic time. We have absolutely no complaints and i don't think we could have dreamed a better day if we tried. The day was so perfect in fact, that when we released all the lanterns, they decided to form a heart shape in the distance! It was an absolute pleasure to work with you and we really appreciate your ability to make us relaxed through the entire planning process, we will gladly offer ourselves as references via phone, email or in person for any prospective clients you have from the UK in future. Again, thanks for all your hard work and sacrifices to make our day so incredible. We really had such a wonderful day thanks to all of your hard work . 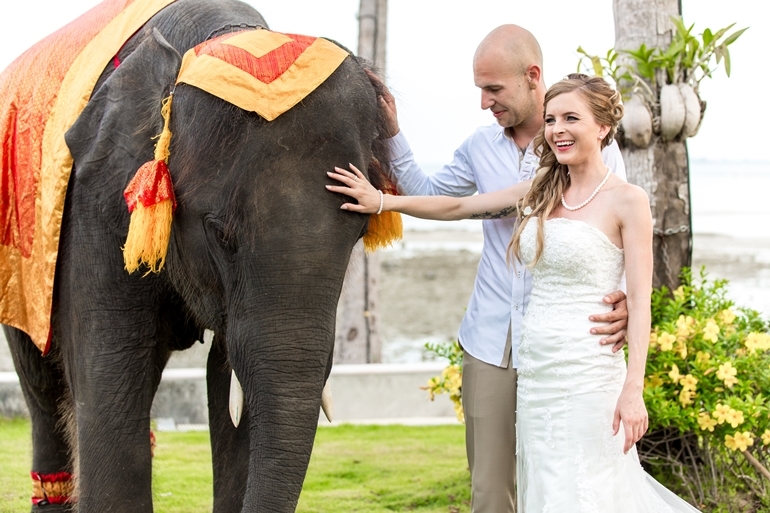 Indeed every detail was perfect the elephant was well behaved and it was just so special to arrive on an Elephant ! The set-up of the villa was excellent ! We are home now in melbourne and sure took awhile to settle back to reality. I didnt expect it to look so grand and amazing. Flowers were awesome and food were delicious. All entertaiment was spot on. 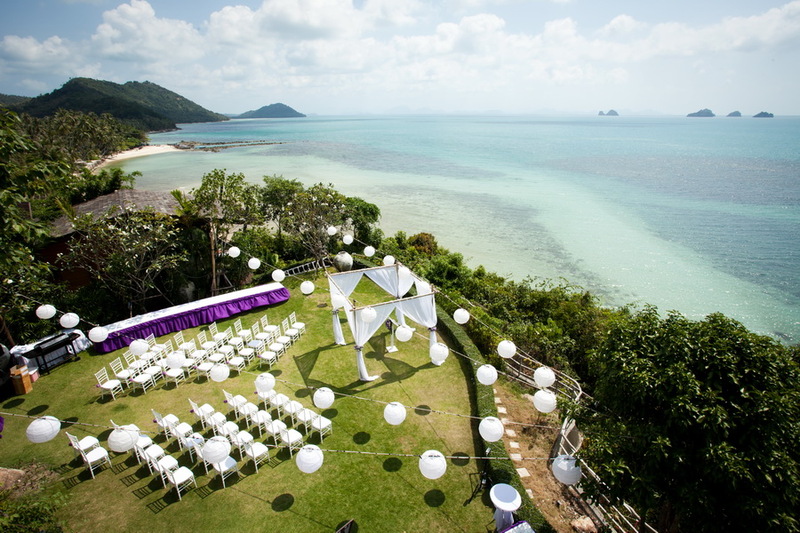 Thank you Tina and i will truly recommend friends to u whenever they want to do a wedding in koh samui. Again thanks a million from the bottom of our hearts. Our stay at Baan Haad Sai was absolutely wonderful. It was the perfect venue for our wedding and everything we were looking for. The accommodation was beautiful, fantastic surroundings and a great team looking after us. Working with Tina at signature weddings was a real pleasure. She very early captured the feel and style of our relaxed wedding and worked closely with myself and my husband to make it become a reality. The day ran smoothly and was everything we hoped it would be. Photography by "Natthawat Wongrat / thailand-wedding-photographer.com"
Thank you Tina and the Signature Wedding team for organising and creating such an amazing day for us. 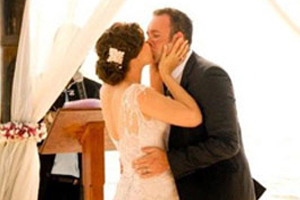 Our wedding was simply perfect in every aspect; in fact it was even more beautiful than I expected it to be. My guests and family are still talking about the wedding non-stop and we all drool about the idea to eat another dinner at the villa. We all were absolutely impressed by the quality of the whole experience. My family has stayed in many beautiful hotels before and we all agree wholeheartedly that the villas we rented were and most likely will always be the most beautiful place we have ever stayed in. Everything from the people who worked there, the food, the location and the place were perfection. Joy if you are reading this: thank you!! We had the most amazing time and you were so incredible helpful and simply a â€˜joyâ€™ to be around. We will come back! I also wanted to thank you Tina, for taking so much time to make sure that the wedding was just how I always wanted it. Planning a wedding via email seemed very daunting to me at first, but because of your know-how and professionalism the planning was a breeze. I loved all the choices you made for our wedding! It was such a perfect week - an amazing day! How you arranged the weather is a little beyond us - but we figure anything is possible with you and Tik. Just wanted to say a huge thanks for organising our amazing wedding day! We loved every minute of it. You are a great person who has given us both so much pleasure. The wedding was out of this world, and it surpassed our wildest imaginations. Chusakan (photographer from Donudes) brought round one photo in a frame for us today and it is incredible - you must recommend him in future as his work is fantastic, as well as him being a superb friendly and nice guy. 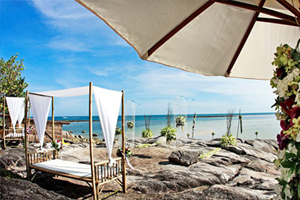 Baan Kilee is absolutely stunning and we definitely want to come back - maybe our 40th birthday! Can't wait for the honeymoon and will send you some photos! Thank you so much for your help with organizing everything for us, without it our wedding would be impossible. It was exactly our we wished what impressed us was the professionalism of all the staff involved in making our perfect day. Thank-you for direction and leadership throughout the process. 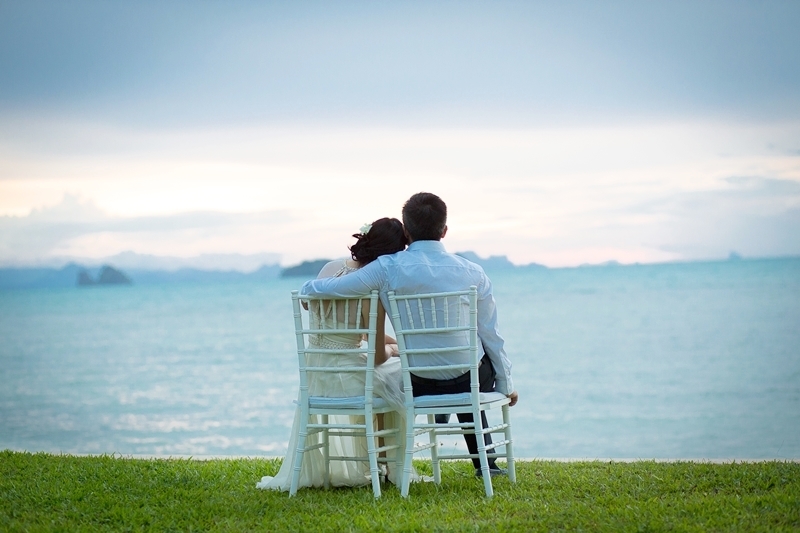 We stayed at Ban Chao Lay in Lipa Noi with close family for a small intimate wedding. When we look back, we still cant believe how perfect our special day was. 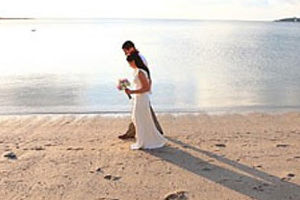 Every request was tailored to suit our needs and planned accordingly, it was faultless. It can sound clichÃ© to say it was and always will be the most memorable day of our lives, but itâ€™s true. The days leading up to and after the wedding are a moment in time that we will cherish forever, and always wish we could turn back the time to experience again. Wedding photography courtesy of Anne-Sophie. Wedding co-ordinated and planned by Tina and the Signature Weddings team. 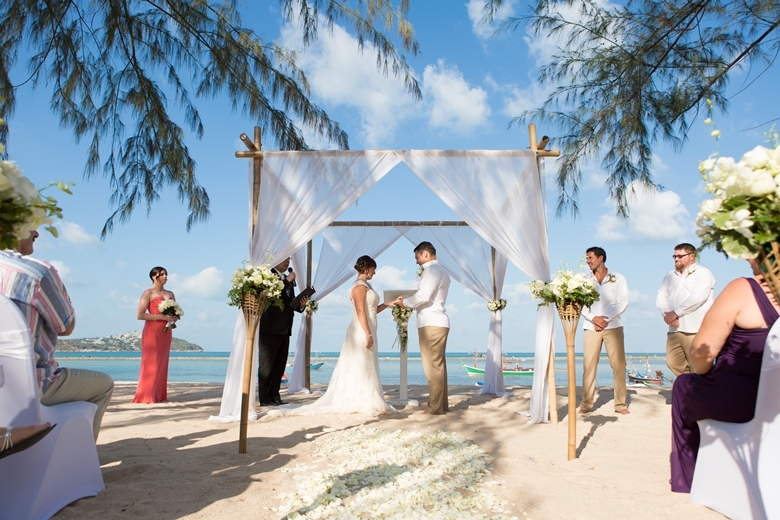 You created for us such a perfect frame for an unforgettable exotic wedding : finest decoration, very nice celebrant, great personalized speech, sunniest ceremony, lovely staff, delicious asian food, fabulous thai dances, incredible fire show, amazing villa, romantic honeymoon ... Thank you so much Tina and your team... words are not enough to express how we loved it ! Tina and her team delivered our perfect wedding. Their attention to detail ensured everything looked amazing on the day and we were as relaxed (as is possible!) during our special day. They demonstrated their complete flexibility when the forecast did not look good and rain looked to be on its way. They devised an alternative plan to cope with the rain and were half way through building an awning on the villa when the weather changed, and everything was thankfully back to plan and within a short time. The ceremony by Johnny, the photographs by Camby, the food (too much! ), the bar staff, the DJ Steve (who played an extra two hours to a rain soaked dance floor), Tina and her team and the villa staff - everyone was fantastic and nothing too much trouble. It was an amazing day that we and our guests will remember forever. 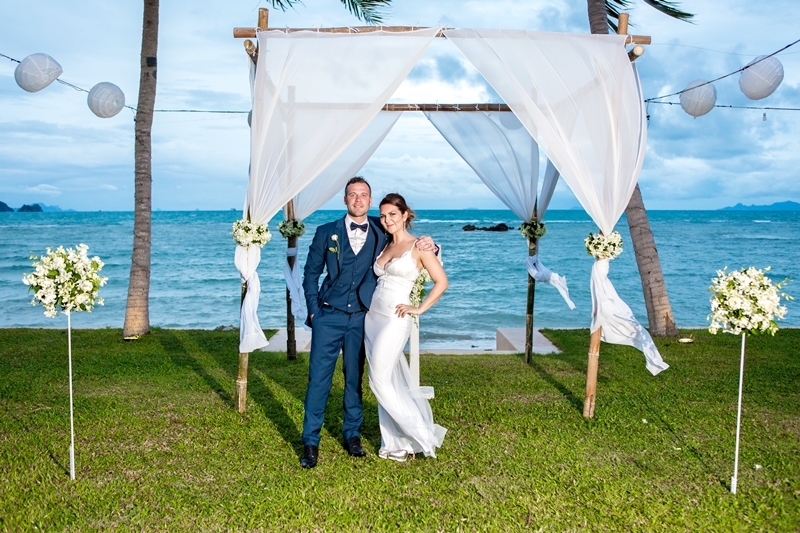 We visited every 4 and 5 star resort in Koh Samui before we picked Ban Mekkala as our wedding location, and we are very pleased with our choice. 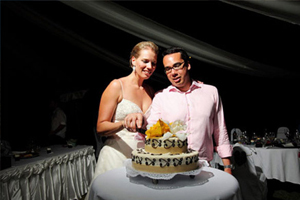 Our wedding planner, and the villa staff were most helpful during the months of preparation and our stay. I was worried about the execution because we could only communicate through email and pictures prior to the wedding. It turns out the venue, celebrant, atmosphere, floral arrangements, all the way to food (and weather!) was perfect. Just as the way I had imagined it. 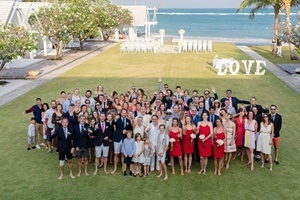 Many of our well-travelled friends said it was the best wedding they have been to ever. Everyone had a wonderful time. 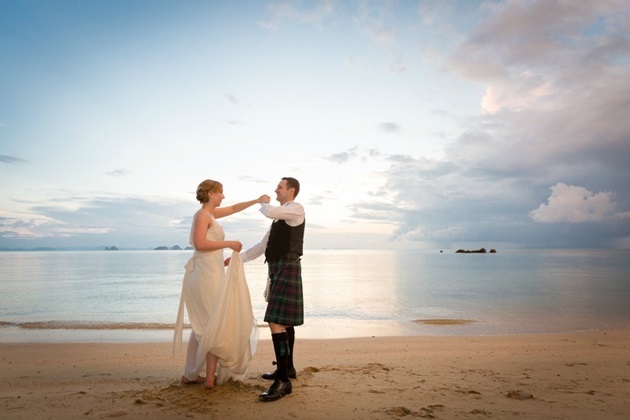 Our wedding at Koh Samui could not have gone any smoother, or have been any better. 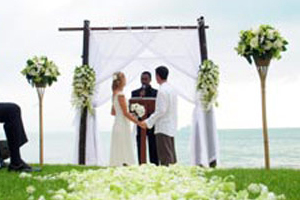 We called Signature Weddings last minute via skype from the United States to coordinate this wedding prior to arrival in Thailand. She set up everything- having someone meet us in Bangkok to take us to the US embassy to have all the legal paper work drawn up, providing a hair stylist, master of ceremony, photographer, videographer, decorations, flowers, fireworks, lanterns, all translations coordinated to make it legal when we got home, we literally did not have to worry about anything. Our friends that were with us say it was the best wedding they have ever been to. 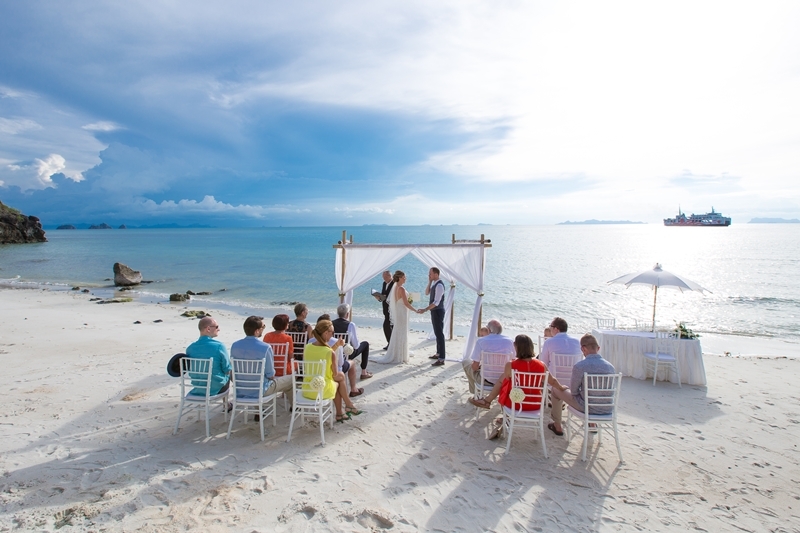 What was a last minute impulse (getting married in Thailand) turned out so beautiful that it looked as if we had planned it for a year. Thanks to all the team, this truly was a lifetime memory of one of the best days of our lives. 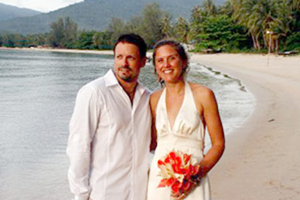 We would like to thank you very much for organising our perfect Wedding at Baan Kilee Villa in November 2009. It was truly like a fairytale in everyway. The effort that everyone put in to make it so perfect and such a special day for us, it was exactly what we dreamt of. all the staff did the most amazing job. Everyone who was involved in the day and the flowers, food, music, entertainment, photos, dvd, table settings, service were perfect in everyway. Having the Signature team there all day ensured everything was attention to detail and fine tuned throughout the day. "Thank you sooo much.. we had an absolutely beautiful wedding.. everything was perfect (except the rain).. You guys did an absolutely wonderful job to make our wedding so fantastic.. The villa was wonderful, the service was top notch and the food was absolutely beautiful.. 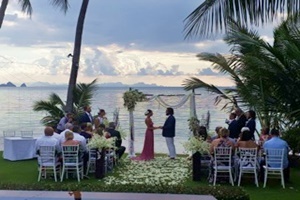 Thank you once again for an excellent job and I have already recommended you all to everyone back here in Australia..."
"I think that Baan Kilee is the most romantic venue to begin a life with someone and you and your staff made the whole event magical. You took my jumbled descriptions and created exactly what I had pictured in my head, I can't thank you enough. I am very particular in the things that I like and the style and attention to detail was second to none." We just want to say a BIG thank you to you all for all your dedication, time, effort and attention to detail in relation to our wedding on the 22 August 2009. You all really helped to make our dream wedding come true. The venue looked stunning - so beautiful! The flowers were elegant, the food delicious and the service top tier! We really did have the best day EVER and have been told by many of our guests that the wedding day was 'magical', 'elegant' and 'lots of fun'! Many Many thanks for all your hard work and creativity. We hope to see you again soon next time we're over in Samui. Many thanks once again with very best wishes. I just want to say a big thank you again for everything. It was perfect in every way. It was THE dream wedding! Mike and I have received the wedding album and DVD...it will be viewed over the weekend....we can't wait...it will transport us back to the week of our lives! Hopefully, we will be back soon to visit you all. Until then, take care and best wishes from the both of us. I just wanted to drop you a line to say thank you so much for everything you did for our wedding. Lee and I had the most perfect day - I never imagined that it would be so beautiful and that we'd have so much fun. We've had so many comments from people who were there and those who only got to see the photos on how stunning it was. Everyone did such a fantastic job - the flowers and decorations and the food were all just amazing and you did such a great job of bringing our ideas to life and making them all happen. Baan Chao Lay was the most beautiful location and all the staff were wonderful. We got back to London last week after a couple more weeks travelling around Thailand. It was such a fantastic time and we can't wait to go back there again as soon as possible. We're still hoping to stay there for 6 months or so in the next 3 years. I hope you are well and, once again, thank you from us both. We will be recommending you through trip advisor as well." 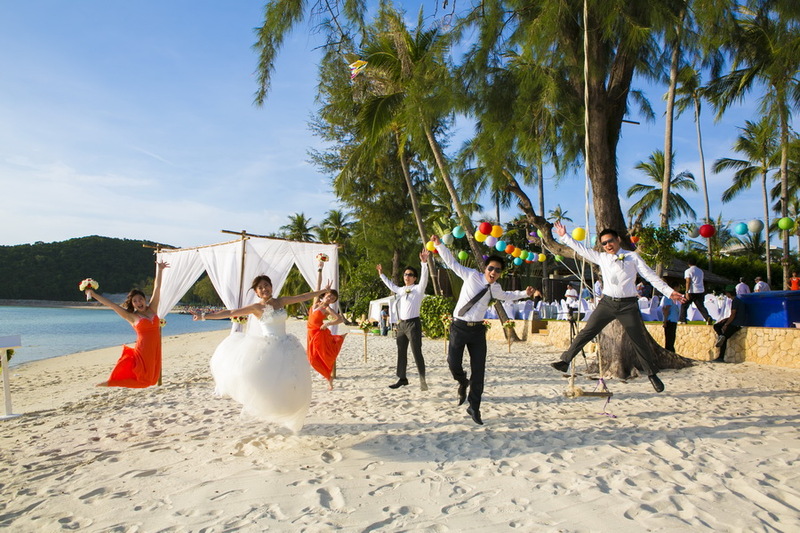 Thanks so much for your email and you and the team's hard work and effort for our wedding at Ban Sairee. Pete and I had an amazing time, there were various points throughout the evening where I had to pinch myself just to make sure what was happening was real - a testament to your handiwork indeed! I am waiting to receive some of the professional photographs from Pam, when I have them I'll be sure to send copies across for you to take a look at. 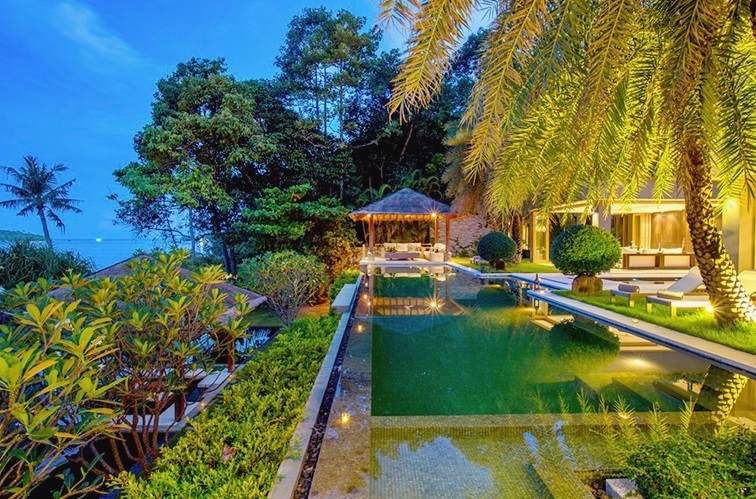 PLease let me know if there is anything Pete and I can do to recommend the services of Samui Villas and Homes and the Villas that you represent on the island. Many thanks again for making our wedding such a momentous occasion. We truly had the happiest day of our lives and we are very grateful to you for helping us to create this. So many of our guests commented that it was the best wedding that they had ever experienced and this was made possible by all of the creativity, attention to detail, co ordination and hard work by your team. The day flowed beautifully and I could relax and enjoy it feeling confident that, Khun Gym, you were on top of it all. Having lived and worked in Thailand I was very grateful at how professional, positive and creative and you, Khun Gym and Khun Jack and the rest of the team were. It is not often like this in Samui! The creative way you decorated the Yantra Hall was wonderful. I literally walked into a fairy tale and it took my breath away for a moment! The the reception at Samudra was beautiful, the decoration, the food, the service. Everything. 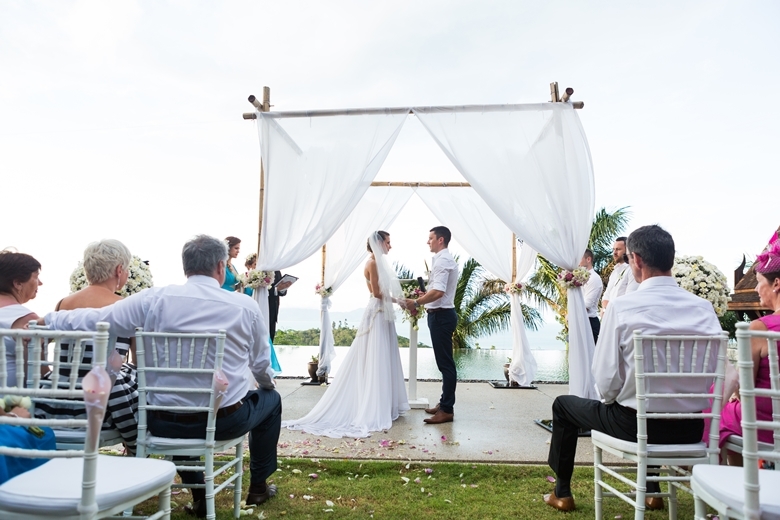 Both Graeme and I were extremely happy with the wedding services you gave us and very grateful to you for helping us to create such a memorable and magical day. "Myself and Gary just wanted to say a big massive thank you to you and your fantastic team, for the amazingly beautiful job you did on our wedding day. It exceeded all our expectations, and we loved every minute of it all. Thank you all so much for all your hard work." I am so sorry for this very late reply. Eugenia thought i had responded to you and I thought she had responded! We both want to say to you and Jack that the wedding was an absolute success. Your efforts and execution were faultless. Our guests were blown away by the event, the service and the food. Most of all though Eugenia and I were able to relax and simply enjoy the day because we knew we were being so well looked after. Once again with all our hearts thank you for making our special day the best it could possibly be. Everyone really loved the party, a number of guests told us it was the most amazing wedding they had ever been to. I'm sure you have inspired many people to return. Thank you for all your help, it was truly beautiful! 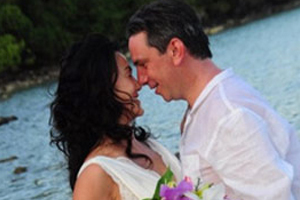 We have only this week returned from our honeymoon - our sincere apologies for the delay in replying to your email. Well, where do we start with thanking all of you for the most amazing day? We are so grateful for the time, attention and solutions given to us over the many months leading up to the day - this certainly contributed to making sure everything turned out just right. 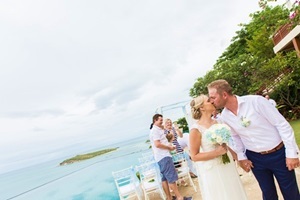 All of our guests commented on what an incredible wedding it was, giving praise to the food and the staff, the villa, the setup and the flowers, and the general flow of the day. It was a particularly lovely gesture for you to meet us at the airport on the day we were departing to share our photos and wish us well - that was a very welcome and unexpected service and we're very appreciative. Please pass on our gratitude to all the villa managers and staff at Kinaree, Reemo and Dhevatara Residences. Particularly to K. Lek, who gave us extra special care and attention. We're fairly certain we'll be back to stay in Koh Samui and/or Phuket, whether at Kinaree or one of your other spectacular villas - on the proviso that K. Lek can be the villa manager for our stay!! 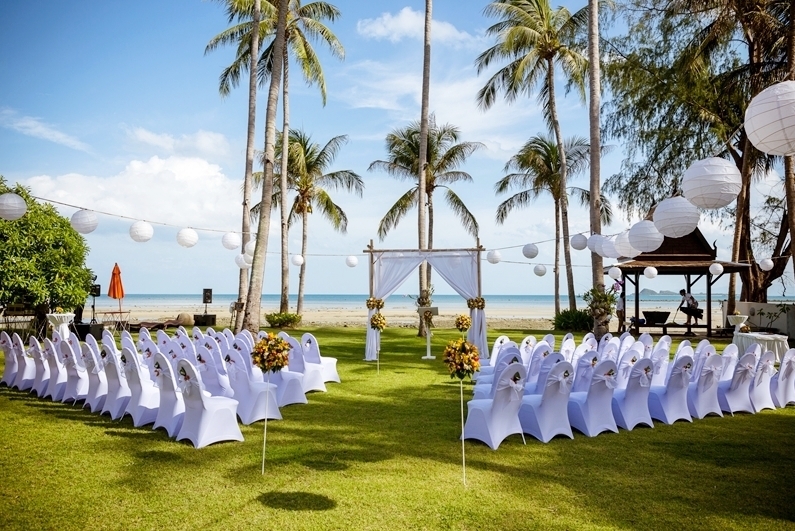 The team at Samui Villas and Homes were a fantastic and professional outfit of friendly, creative and experienced individuals who worked wonders to make our day the most memorable of our lives. I just wanted to write to say thank you very much for all the time and effort you and your team put into the wedding. Aaron and I had a beautiful day and really enjoyed ourselves. Both families had a great time and loved staying in the villas, its a shame it had to come to an end and I am back at work now! Just a quick note to say thank you once again for the fantastic job you and your team did in organising our wedding. It was better than we ever could have imagined and we loved the special details that made our wedding so memorable for us and our guests.